SPC Maker’s latest Mini Whale drone is a well-made, compact and light FPV quadcopter with stunning specs. Featuring 78mm sized carbon fiber frame and Whoop alike blade protectors, it is just perfect for indoor practice. The SPC Maker Mini Whale 78mm is available in two variants. While the “Standard” edition comes with Runcam Robin 700TVL camera, the “HD” version features a much versatile Runcam Split Mini 2 1000TVL. In addition to the higher resolution, the SPC Maker Mini Whale HD is capable to record the journey of your FPV flights on-board. 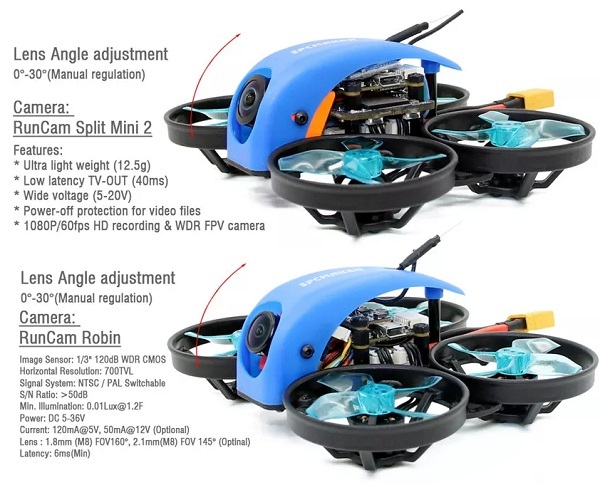 Both versions adopts same type of F4 flight controller and 10000KV brushless motors. In order to be light and durable, just like the FullSpeed TinyLeader, the Mini Whale 78mm also combines 3K carbon fiber elements with plastic. Each polypropylene blade protector is attached to the 1.5mm carbon fiber frame with 3 screws. 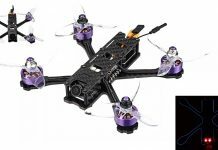 According to your existing remote controller, you can opt to purchase the SPCMaker Mini Whale 78mm quadcopter in bundle with pre-installed Futaba, FlySky, Frsky or Spektrum DSMX/DSM2 radio receiver. Optional Futaba, FlySky, Frsky or Spektrum DSMX/DSM2 radio receiver.